Before you start a coffee shop (or any type of small business) it’s prudent to have a firm understanding of the advantages and disadvantages of the business model so you know how to prepare. The goal of this article is to give you a clear understanding of the pros of operating a coffee shop so you can fully exploit the opportunities. But it’s not all sunshine and unicorns. We want you to understand of the cons so you know how to address the weaknesses that might could lead to business failure. Finally, we also want to help you figure out if this is the “right” business for you personally. For some of you reading this now, opening a coffee shop is the correct choice based on your goals. For others, not so much. No matter what decision you make it’s totally okay! You need to pursue the projects that make you fulfilled. We’ll begin with the positive aspects fo this business first and then move to the risks associated with the business. Let’s go! Habitual Drink: Firmly planted on the the pro side of the spectrum is the fact that coffee is a habitual drink, meaning people consume it daily without even thinking about it. How many people do you know that buy a coffee during their commute to work no matter what? It’s a habit. The power of selling a product people consume daily is extremely powerful. For comparison purposes, you can expect a higher frequency of visits per customer than you would a restaurant. Even if you really love the ma-and-pa pizzeria down the street, you probably won’t eat there every week or even every month. Infrequent visits are not the case with coffee, however. The same customer could order a cup of Joe from the same establishment almost every single day and it wouldn’t get old. Purchasing coffee from a specific shop can becomes part of the daily routine, almost like working out. This means that after doing the hard work to win-over a loyal customer, you could generate sales from each person on an almost daily basis making it a great business to be in. Full Control: If you’re considering starting a coffee shop of your own, you may already have a vision for the place. You might already know what part of you plan to open. You can imagine the kinds of customers that will visit your establishment. One of the advantages of starting a coffee house is that you have total control of the vision, the operations, the culture and brand. You literally have control aspect of the business. In other words, you’re the boss! There’s no one to answer to with the exception of yourself and your customers. Being responsible for every decision no matter how big or small is good and bad depending on how you look at it. But for most owners, the opportunity to be creative and establish a place that’s truly their own is something that makes business ownership appealing. Mission: Many of today’s most successful startups are driven by much more than bottom line profits. They also have a social mission that drives the work they do. One terrific example is the shoe company TOMS. Sure they create comfortable shoes, but it’s the company mission makes them so much bigger than an apparel company. Each time you buy a TOMS shoe, an underprivileged child is donated a pair of shoes in return. As an independent coffee shop owner, you have the opportunity to make a difference in the causes that are important to you as well. One way many coffee business owners choose to make a positive impact is to purchase coffee from roasters that also have a social mission like Safehouse Coffee Roasters. While these coffee beans sometimes cost a little more, the mission is more important than maximizing profit for some owners. Another example utilizing coffee as a vehicle for a larger mission is Refuge Coffee Co. Refuge Coffee Co. is a non-profit that uses their coffee shop and trucks to help train refugees to gain the skills needed to be employed in the hospitality industry. You can check out a previous podcast interview with them here to learn more about their story. By owning a coffee shop, you really will have an incredible opportunity to serve the community and causes you’re passionate about. While you’re in the business planning phase is the best time to start thinking about the greater purpose and goals of your business. High-Profit Margin: We’ve already discussed the frequency that people visit coffee shops. But the other advantage of operating this business is that it can be an extremely high-profit margin business compared to others in the food service space. While every coffee shop will have different margins and costs, many coffee shops make 70% gross profit per cup of coffee. This estimate includes the cost of coffee beans, cream, sugar, stir straw, and the disposable cup needed to serve the beverage. You’ll need to do your homework to source the coffee beans, cups, creamers, and other items to determine what your exact cost will be in your shop, but even if your coffee shop makes a conservative 60% profit margin per cup, you’re not doing bad compared to other entrepreneurs in other sectors of the food industry. To put things in perspective, a 33% food cost in a restaurant is an acceptable industry benchmark for most menu items. Market Demand: Some businesses start without the advantage of knowing people actually want their product or service. If you’re selling coffee that’s not an issue. You can be confident in knowing that you have a product people want and are willing to pay for. Any city with 40,000 residents or more located in the United States or Canada will be able to support a coffee shop. You’re not reinventing the wheel with this business model and you can be confident in knowing that if you’re able to execute, you can operate a profitable business. Growth and Income Potential: Success leaves clues. There are plenty of rags to riches stories of tiny coffee shops that have grown into juggernaut corporations over the years. If someone else can start a massive coffee brand from nothing, it’s possible for you to do the same as well. While it won’t be easy to replicate the success of other businesses, the fact that there are many major players like Starbucks, Caribou Coffee, Peet’s Coffee, Ryan Bros., and others demonstrates it’s possible to make an enormous amount of revenue if that’s your goal. In fact the entire U.S. coffee market is a reported $5.18 billion in sales annually. This means there’s a big enough pie for many large and small businesses to enjoy a slice or two of success. Before you persue a business, it’s important to understand the challenges so you can build a plan to face them head on. The goal of this section is not just to tell you the challenges, but give you action steps you can take right now to transform weakness into strength for your small business. This list of cons was compiled with help from Bryan Reynolds the CEO / Founder of Anthem Coffee & Tea, a six location independent coffee business in Washington. Needless to say, he’s the type of person that understands first hand the challenges and opportunities this business can represent. Click here to watch our in-depth guide on starting an independent coffee shop with Bryan Reynold’s, CEO / Co-Founder of Anthem Coffee & Tea. This in-depth video training will set the right foundation for building a profitable coffee business. Creating a Unique Brand is Essential for Success. Competition: There’s a place to buy coffee on what seems like every street corner in the United States. Between coffee chains, independent shops, cafes, fast-food restaurants and convenience stores there could be dozens if not hundreds of beverage options in your city. When there’s an abundance of coffee options to choose from you need to focus on what sets your brand different from the rest. This is one of the biggest pieces of advise that Bryan and countless other entrepreneurs have shared as a key factor that determines success or failure of a coffee business. Action Item: Get clarity on what makes your coffee shop different than any other location in town. Ways you to begin identifying the unique aspects of your brand include figuring out what group(s) of people you want to serve, establishing a company mission, and of course sourcing a one-of-a-kind coffee roast so that you can clearly different the core product offering. 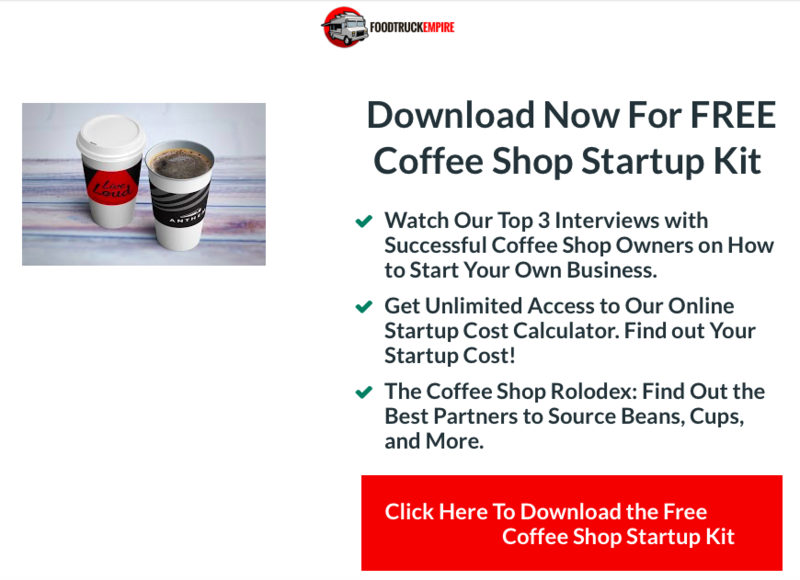 We provide you some handy worksheets for helping to form the idea for your brand in our free private Coffee Business Startup Community. Join here for free. Getting the Word Out: Most small businesses struggle with marketing, especially in the beginning. You’ve probably heard other operators across every industry lament that when people try their food, beverage, or service people love it. In spite of a quality product or service, these small business owners struggle to get their name out there. When you open your coffee shop, no one will know about it short of your closest friends and family members. The first challenge you’ll face it to get the word out to the community so people know you exist. You could write an entire book on the topic of marketing a coffee shop and generating more sales. In fact there literally thousands of books, training seminars, and classes on the topic of marketing and sales… That’s how big of a challenge this aspect is for small businesses! Action Item: There are an endless number of strategies and tactics you could use to generate awareness for your coffee shop locally: Radio ads, signs, newspapers, giving out free samples, social media marketing, coupons, direct mailing ads, and the list goes on. While each can be an effective part of your overall marketing mix Bryan Reynolds CEO / Co-Founder of Anthem Coffee & Tea recommends taking a different approach to promoting a coffee shop. One approach that’s worked well for his families business is finding ways to serve different groups of people in his community through a coffee shop. Let us explain. 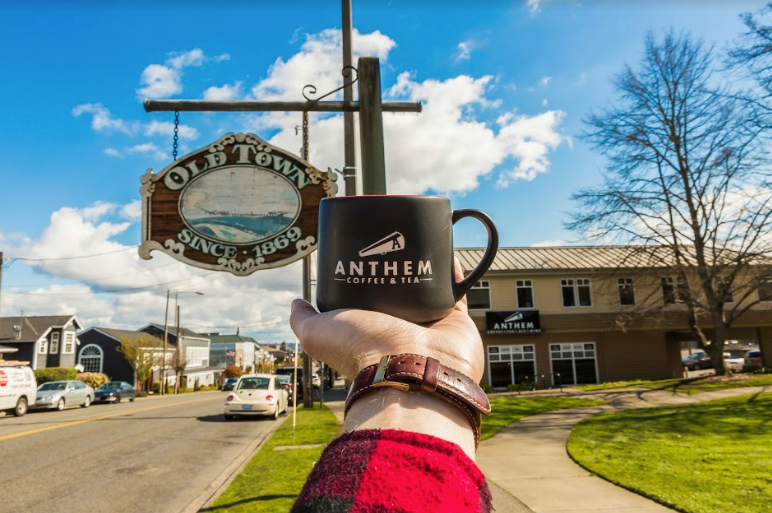 One specific way Anthem Coffee & Tea will serve their community is by allowing people to host fundraisers and small concerts at their venue for free. These sorts of special events create a win-win for the business owner and community members. People in the community get to utilize a great space for their event at no charge and the business attracts a new customers to their establishment. Start coming up with a list of ways your coffee shop could benefit different groups of people in your community. If you want to learn more about this process and discover more ways to effectively market your business read our post on the topic. Losing Money: The risk of losing money is a real one with a coffee shop. How many times have you seen a restaurant or other small shop in a strip mall close down? Every time a small business like this closes it’s doors it unfortunately represents tens of thousands, if not hundreds of thousands of dollars in losses of the investors and business owners. 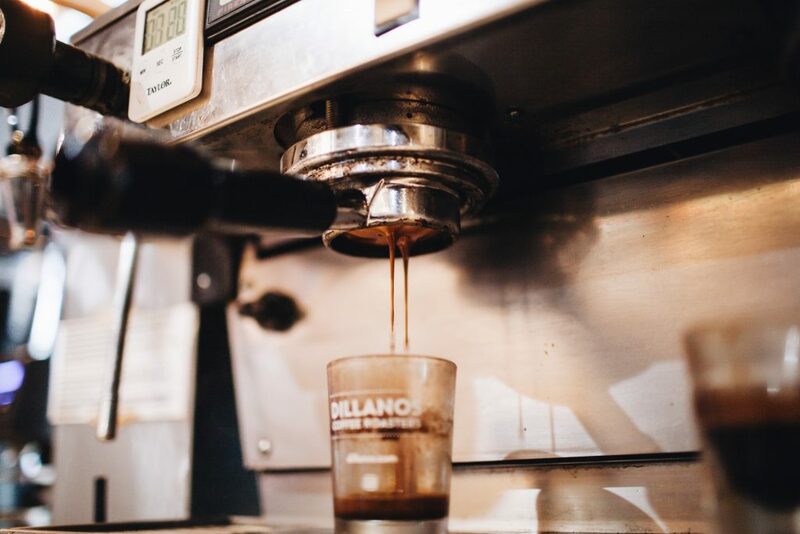 While the total cost to start a coffee business will vary, you can expect to invest between $100,000 – $400,000 for a retail location and all the equipment. When the Reynolds family opened their first coffee shop location it required $360,000 in capital just to open the doors. To get the business of the ground, the family took out a loan against their home to make it work. If the business had failed, it would have been a devastating financial loss. Action Item: First you need to do some serious reflection to figure out if you can handle making this level of a financial risk. Ask yourself if you would be okay with the worst case scenario. If you can’t see yourself risking a few hundred thousand dollars to start a coffee shop right now don’t get discouraged and give up. There are baby steps you can take to start moving in the direction of owning a brick-and-mortar location that require less financial risk taking. A drive-thru coffee kiosk, a coffee truck, or providing coffee catering services are ways to break into the the business for less than $100,000. Long Hours and Hard Work: When first time business owners open a coffee shop, hard work and long hours is usually not the first thing that comes to mind in someones day dream about the business. But working grueling hours and on different parts of the business will be a reality in the early days. During the first few years of Bryan’s business, he was regularly putting in 80 hours or more per week to get the business off the ground. Failure was not an option and was willing to do whatever it took to help the business. Fast forward to today and Bryan works a much more manageable 40 hours a week on the business, but the transition to a better work life balance took time. When you start, expect to wear many hats from making the coffee, cleaning bathrooms, greeting customers, doing the books, ordering supplies, and marketing your business. Action Item: Assuming you don’t plan to operate the coffee bar as a one man or woman show forever, you’ll need to hire team members and put procedures in place that create a standard for how things get done in the business. While you’ll be hands with everything when the business opens, start by writing down the list of tasks that you eventually want taken off your plate. After you determine the tasks you would like an employee or manager to complete, document the process for getting it done the right way on paper. These documents will ultimately become your training and hiring guides. While it can be time consuming to document these activities, it’s the only way to ever remove yourself from the routine day-to-day tasks. Team Building: Another aspect of running a successful coffee shop that’s overlooked is the need to hire employees and build a team. Hiring managers and having a staff of employees is an element that’s often overlooked when people imagine what it will be like to operate their place. Know that if you want to take a day or a week off for vacation at some point in the future, you’ll need to hire people to manage the shop while you’re away. This means you’ll need to get comfortable training people, coaching, and resolving conflict at work. You can learn more about the hiring process for coffee shop employee here. Action Item: Begin writing down the qualities each of your employees should display. All should be friendly and customer service oriented, which are personality traits that can’t be trained. You can teach someone to make world-class latte, but it’s impossible to train someone to be kind to customers. Join the Coffee Shop Startup Private Community Here for Free. Now that you understand the strengths and weaknesses of this business, you’ll need to ultimately make a decision. Is this the right business for you or not? Only you in your heart of hearts can answer this question. But one final tip we have while you’re still in the decision making process is to begin writing a business plan for your company. There’s no cost to researching the business online, borrowing a book from the library, or putting your ideas onto paper or a Word Document. If you decide to move forward with the business, you’ll need a business plan anyway. If you decide not to, you can be confident in knowing why this sort of company isn’t for you.